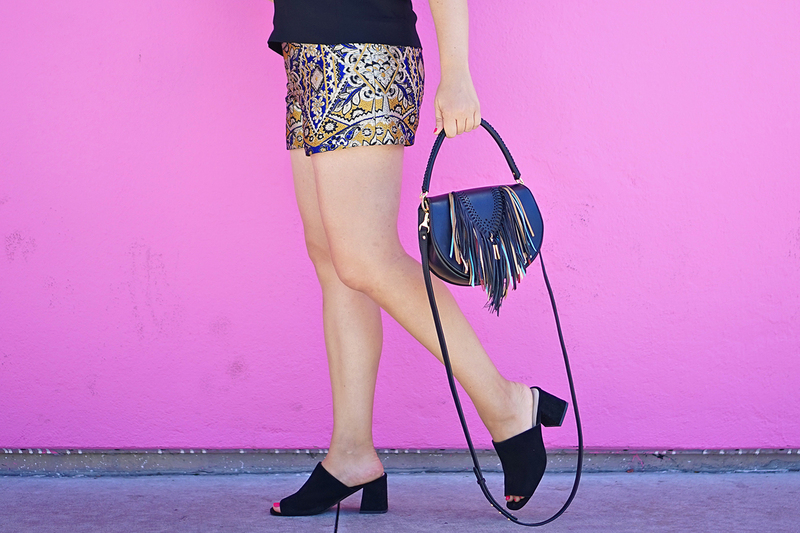 If you can't wear brocade shorts and a double breasted blazer in L.A., where can you wear them? Believe it or not I scooped up these Alice and Olivia brocade shorts my first day in Pasadena. I was running errands around town and decided to pop into the nearby T.J. Max. I should say that normally I have terrible luck at places like Marshals and T.J. Max. I don't know how people always find such incredible brands and prices, because I never do. Until Pasadena. I immediately noticed that the T.J. Max in Pasadena had a pretty large designer section, and it wasn't completely picked over. I was immediately drawn to these shorts. Sure, they are not super practical (I certainly won't be lecturing in them), but they were such a great deal, so cute, and, well, perfect for L.A. I love how fashionable everyone is here. It is super fashion forward, but unlike chic east coast cities, it seems to be much more laid back and daring. I guess I would describe it as funkier and less put together. I debuted my fun new shorts on my day of L.A. adventures with my cousin. Of course we had to stop by the infamous pink wall at Paul Smith on Melrose. It was the perfect opportunity to take some outfit photos and show off my gorgeous new Digerolamo fringe bag, which was sent to me in L.A. all the way from Florence. I am obsessed with this bag! 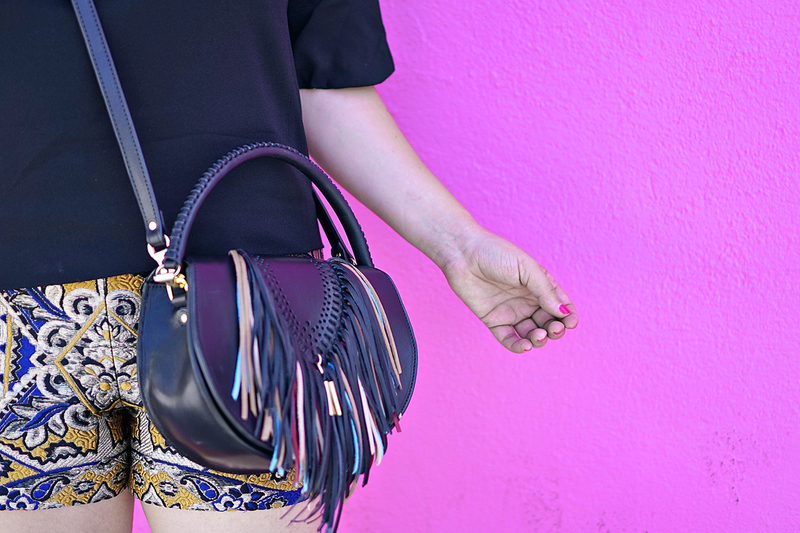 It is the perfect size, shape, and the fringe detailing is so unique. Clara even stamped my initials on the back. Digerolamo is the best! There is no better place to pick up a hand-made, authentic Italian leather bag in Italy (you can read more about Digerolamo here). I love the juxtaposition of the serious blazer with fun shorts. I am thinking of adding back tights and an oversized sweater to transition them into fall and winter (Florida winter that is). While these shorts are obviously not available online, I have linked some similar options below. Would you rock brocade shorts?